This is certainly not a drinking snack but rather one for the day after to combat any ill effects of indulgence the night before. We got a juicer a long time ago. We used it for awhile but then lost interest in it for some reason (probably because it was so hard to clean the blade/filter) so it has been sitting around for a while. In any case, we “rediscovered it” (probably because we found a brush that is perfect for cleaning the blade/filter) and decided to make some “healthy” juices. The first one we made was carrot juice. 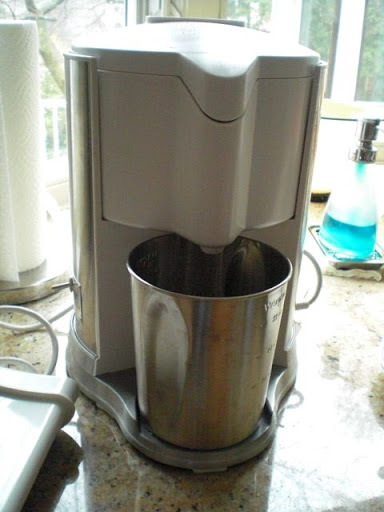 This is what the juicer looks like. 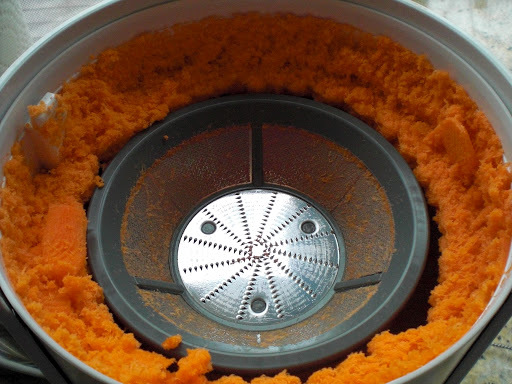 Vegetables or fruit are fed through a slot at the top where they are ground up by a high speed spinning grater and then centrifugal force pushes the grinds up into a metal micro filter and the juice is extracted. The juice then comes out from the spout into a beaker below. The remaining pulp was further pushed up into a holding area (3rd pictures below). We used 6 good sized carrots peeled which is the maximum about we can juice at one time. 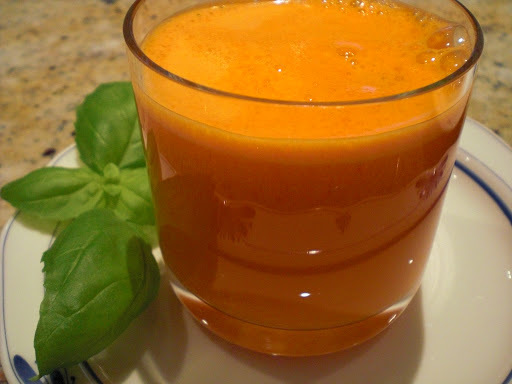 Compared to store-bought carrot juice, it is nicely fresh tasting and very sweet. This is a perfect alternative to orange juice for the morning. I am planning to make some nice dishes using the juice. My wife, however, doesn’t want to waste all that pulp. She thinks we should be able to use the carrot grinds for something–so stay tuned.